Since writing about context and content a couple of weeks ago, the topic seems to be everywhere. For me this asks some big questions about the relationships that brands have with consumers. Or rather, to be more accurate, the ‘relationship’ that consumers have with brands, which is arguably somewhat less than brands themselves overstate it to be. It came into real focus recently when I participated in a workshop run by the IPA, looking at how the new coalition might use marketing insight and interventions – of any kind – to bring the Big Society to life. 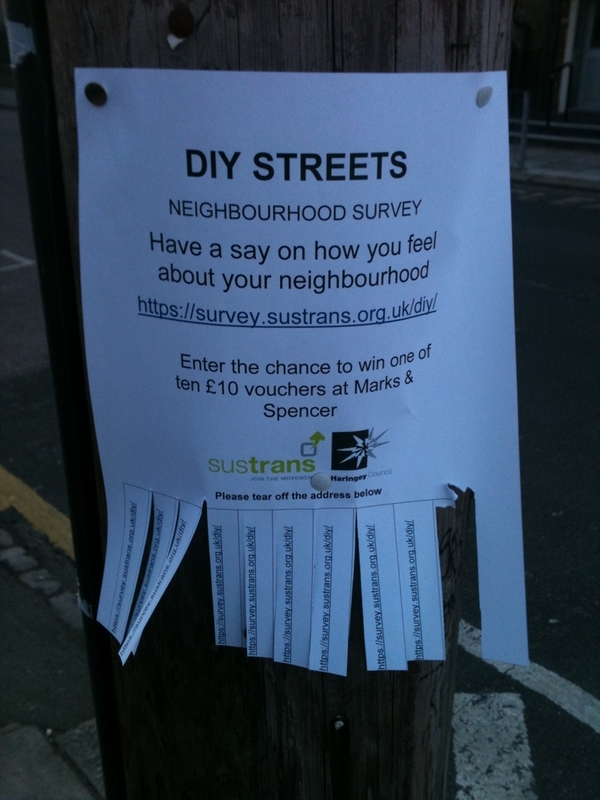 I spent a moment or ten relaying my experience of a project I’ve talked about here before, DIY Streets. It’s got people engaged within my neighbourhood around the idea of coming up with imaginative ways of solving whatever problems the community has diagnosed. Like any North London mid-30s advertising person I’ve spent as much time discussing this project as I have actually doing it. I’ve also spent a lot of my time engaging with it online – via the blog, the facebook page, emailing with the Sustrans charity, etc. But obviously, there’s loads of people not set up for that sort of contact, or who don’t care for it. And, after all, the whole thing is supposed to be about the community space itself. That geographical, physical space that defines where I live, where my children go to school/nursery, and where I, like everyone else, arrive home every day. The issue of context is particularly important here, I think. As people’s priorities get more personal they frequently become more local. The tendency of digital – pretty much in the other direction – is to help people connect regardless of location. The more mobile internet takes up the easier it will become to merge these twin impulses. But do you bring people from the physical space to the virtual? Or the other way around? If it’s the former, then how do you help people less comfortable with going online to remember where to go once they do? On my way to school the other day, I saw this. It’s really lo-fi, but I love it. Almost as much as the fact that one of the strips had been taken. Nevertheless, the troublesome thing is that there seems to be a gap somewhere between my engagement with the DIY Streets idea, and the place where its ambition is aimed. And that’s on a project where the location couldn’t be more salient, or more convenient, for me. This engagement gap is the problem I think most brands are trying to solve. Digital seems like the place to solve it, if only because it’s where the ambition and the engagement for once merge. I suppose brands feel better about it, because it feels more like an interaction where an objective has been realised. But how does it feel for the ‘consumers’ concerned? I guess this depends on how much value they feel they’ve had from the interaction, beyond having had some time idly passed by clicking on a few buttons. And if all that really happened was that a brand managed to find you when you happened to be somewhere they were as well, online, then what does that mean for your future usage with the product? And let’s not even mention the word ‘relationship’.